Sometimes I’m a slow learner. At least it was in the case in believing I was a child of God. It was hard enough believing in something I couldn’t see, or touch for the first time. But as a proverbial father? I had one…I didn’t need another. It was in a college Bible study and we were looking at the scriptures where it refers to being ‘adopted’ into God’s family by Jesus’ sacrifice and the Spirit’s presence. 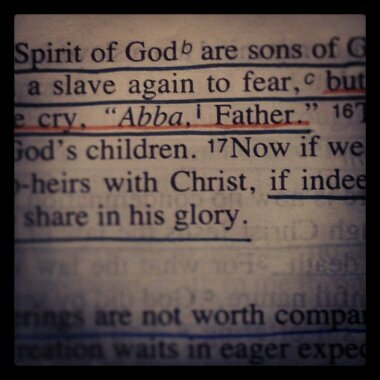 As the truth that I indeed had an Abba sunk in…so did this beautiful word…beloved. I’ve never felt beautiful. I’m not pretty…no one ever thinks the ‘tom boy’ is cool. But suddenly in that one simple word, beloved, I felt God’s presence attacking my heart…making it firmly known that God considered me both. In that moment, it didn’t matter the names people called me, what they said about me or their firm opinions of who I should be and how I should act. In that moment my Abba had declared me his beloved. I’ve held onto that so hard over the years as media assaults our senses with what you should be, how you should look and societal expectations of women. It becomes harder and harder to remember that I am God’s beloved daughter. But as someone who has finally found the value in not only having women as friends, but truly as sisters willing to walk through the gauntlet with you, I find it is much easier to navigate this world with others by your side. So let us walk in love as we walk others into God’s love, as God’s beloved children.